Air Compressors are one of the most important pieces of machinery in your facility. AIRGuard compressor monitoring and control connects you instantly from anywhere to real-time information 24 x 7 x 365 that prevents failure while maximizing efficiency. AIRGuard easily connects to your air compressor’s control panel via hardwire connections or the data rich modbus port. Using state-of-the-art technology, OmniMetrix retrieves and transmits vital information to our cloud based system, OmniView. With the ability to view and diagnose critical information from a PC, tablet or phone, AIRGuard is the clear choice in air compressor monitoring. 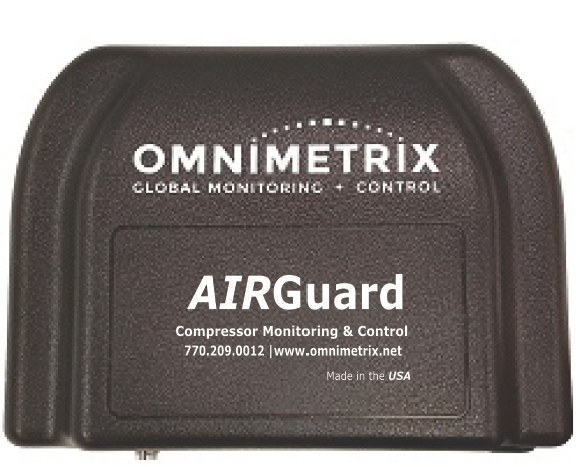 The OmniMetrix AIRGuard wireless remote monitoring and control system is the reliable, cost-effective solution for air compressor monitoring. It connects to most modbus enabled air compressor systems to easily access and diagnose potential issues and failures. The AIRGuard system has the ability to monitor key items that provide peace of mind and increases reliability and efficiency. Once your unit is active, all programming and updates are completed over the air at no additional cost; there’s no local software to install. Both your monitor data and updates are transmitted over cellular networks, so you’ll never have to hard wire your unit for transmission. With something as important as your facilities air compressor, it’s vital your company’s operation stays up and running at all costs. Utilizing innovative technology like AIRGuard, now you can detect failures which used to have gone unnoticed until it was too late. Whether being used internally or in conjunction with your maintenance provider, AIRGuard prevents failures from occurring. OmniMetrix can provide more data and more insight to make the proper choices and decisions as it relates to your air compressors. By utilizing over 20 years of IoT/M2M industry knowledge, we’ve designed a product that provides unlimited data, reporting & graphing tools for all your data analytical needs. Why take the time out of your busy day to physically check your compressors, when the information you need is on your phone or desktop computer? The AIRGuard monitoring system proactively notifies you and/or a maintenance provider if any particular parameter reaches a critical point that may cause a failure. Solving a problem, before it’s a problem, makes everyone more efficient. How will I see information about my compressor once it’s monitored? If you like, updates will be delivered to you via text and email notifications. We also provide a convenient web-based portal for checking the current data from your air compressor in OmniView. OmniView is available at any time and allows you to check any data point on any of your monitored compressors. Why should I use a cellular transmission to transmit data? Using a cellular transmission means that you can implement monitoring without running into complications with IT or incurring additional costs in having an available Ethernet cable available at the compressor site. Cellular networks continue to be a cost effective and secure way to transmit your vital information. In the event a cellular network is not available, please contact us to discuss other available options. Will I have to get my own cellular plan to cover the data transmission? No. Your data transmission on monitored generators is covered by OmniMetrix in the annual Monitoring and Managed Services fee. What if there is no cellular coverage at my compressors location? There are additional measures we can take to assist in cellular coverage including extension cables and signal boosting antennas. To discuss other data transmission options, contact us for further discussions around capabilities and pricing. What value does OmniMetrix provide after purchase and installation? Constant data processing through OmniMetrix means that we manage the monitoring, transmission, and user interface so that you can focus on what really matters. Your monitoring will also be complemented with ongoing customer service from our dedicated, US-based support team. What costs can I expect from remote monitoring? To acquire your devices and keep them running, you’ll cover the hardware charge, annual monitoring fee, one-time activation, and shipping for devices. Bulk quantity is also a relevant factor to pricing. After purchase, the only ongoing cost you’ll see is your annual monitoring and any new device or parts purchases you desire. As long as you’re still actively monitoring, our customer service comes included at no additional cost. What information do I need to provide to get a quote on remote monitors on my air compressor? The primary items we need to identify your needs are the make and model of the control panels on your compressors. The control panel is where you’ll typically find the on/off key and emergency stop. If you can’t identify it the control panel, you can send us a picture. The reason we need the control panel information is because we connect directly to your compressor’s control panel. The alarm points and faults available for tracking are determined and vary by each control panel. Does the age of my compressor matter? No, the age of your air compressor will not prevent remote monitoring. However, the age of your compressor may determine exactly which data points we can retrieve from your compressor with monitoring. Can I monitor multiple compressors with a single monitoring device? All though it is possible to monitor multiple compressors with a single unit, our system is ideally used with a single monitor per compressor to maximize the data available to you. Does OmniMetrix provide installation services? We’ll be a part of the installation process for your air compressor monitor, but we don’t provide actual on-site installation technicians. In the event the installation goes beyond the service team or requires custom solutions, our Engineering Solutions team can aid in the setup and completion of your project. Regardless of your individual situation, we will help ensure monitor installation. We offer live phone support and written installation guides for specific control panels. Secure, web-based management with OmniView. OmniView lets you check the status of your air compressors from any place at any time.